David Long specialises in fact-filled books about the capital, including the excellent Spectacular Vernacular and Tunnels, Towers & Temples. His new book explores the alleys, courts and yards of the Square Mile (and sometimes beyond). Such a task would have been much harder 100 years ago. Before the Blitz and the subsequent redevelopment of the City, the area was teeming with tiny cut-throughs and yards. Back another century or so and the situation was even more higgeldy-piggeldy, as a glance at the John Rocque map of 1746 will show. London in medieval times would have been nothing but alleys, and stinking ones at that. Yet many ancient snickelways, ginnels and shortcuts remain, often with evocative names such as Hanging Sword Alley, Bleeding Heart Yard or Hen & Chicken Court (why not just Chicken Court?). David Long tackles the subject alphabetically, from Abchurch Yard to Wine Office Court, and also throws in a few appendices listing all the City churches, parishes, wards and street name derivations. There's many a fine tale to tell. Find out why Turnagain Lane and Wardrobe Place are so named, how the stock exchange was founded down a passage, and indulge in some welcome mythbusting on the history of Ely Place. There's a dry humour throughout (in Passing Alley, a 'tell-tale...odour suggests the name has been upgraded in recent years'), and the author imparts just enough information to be interesting without getting bogged down in detail. You'll find yourself scribbling down a couple of dozen places to seek out next time you're in the City. If there's a flaw it's in the presentation. The numerous photos (taken by the author) are unlabelled, and it's often unclear which passage we're looking at. Maps would also have been useful, given that some of these spaces are absent even from the pocket A-Z. But we mustn't quibble. London's interstitial spaces have long deserved a dedicated book. Like the tangled web of alleys north of Fleet Street, it's easy to get lost in this well-researched and compelling feat of superhyperlocal history. 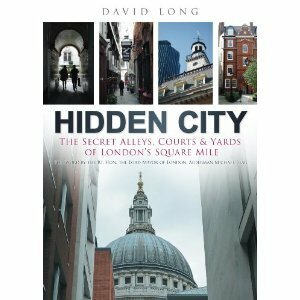 Hidden City: The Secret Alleys, Courts & Yards Of London's Square Mile by David Long is out now from The History Press. Like this? Check out our own peregrinations through the city's alleys in Londonist's Back Passage.